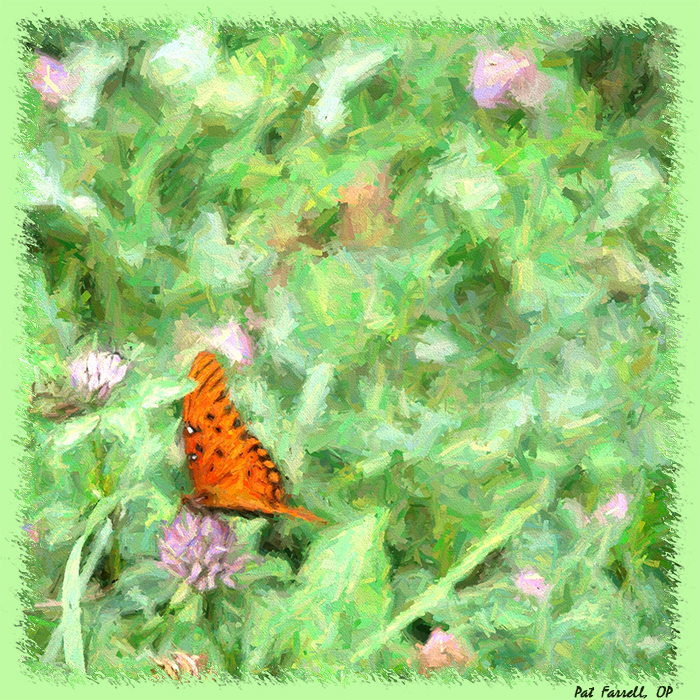 How much time does the butterfly or the clover have? This is beautiful, Pat! You are the artist behind it, right? Pastels? Noticed you are no longer in California. Hope you are doing well! Thanks!! Yes, I’m the artist, and in this case it is a photograph with post-processing to look like a chalk drawing. I am in the Chicago area for a few years, though I “come home” to California periodically. I consider the change in weather an adventure, and for the most part have enjoyed it. It is very pretty when it snows. It is good to hear from you and to stay connected. I need to connect with Dora. Detroit is not all that far from here! That is a gorgeous picture! what are you doing in Chicago? I am stuck in Yuba City, where mom lives, and where I returned when I left the monastery. I hope to get out of here one of these days! What a nice surprise to hear from you, Debbie! 🙂 It seems that this is the post to bring my friends from time past. I am in Chicago because of my position as the Director of the Dominican Sisters Conference – I need to be more centrally located than California (as much as we think it’s the center of the universe). It’ll be a few years that I’ll be here. I hope you are at least able to get some weeks or days away for a change of scenery, and that you are well. I’m sure your mom is happy to have you close.